Grows new, healthy hair. Doubles the follicle size of existing hair. Slows down and stops hair loss. In addition to being the world's first clinical strength FDA OTC Cleared wearable laser for hair growth, the Theradome™ is also cleared to increase the diameter of the hair you have by up to 200%. 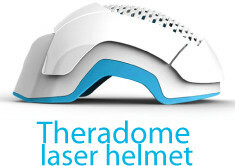 Theradome is an in studio laser helmet, that combined with a special hair follicle stimulating service, is the only FDA approved wearable laser hair growth product available today! Come in and relax while one of our specialists apply and massage the carefully formulated scalp treatment allowing you to experience the sensational tingling effect of our hair follicle stimulating therapy! Immediately following your scalp treatment the service is completed by wearing the Theradome helmet for a short 20 minute session twice a week! Each session is affordably priced at only $15! We also have package deals available. Our studio offers a private area to ensure our clients the discrete comfort of receiving treatment in a soothing relaxing environment. Less hair in the shower and on pillows. Improved luster and fuller body. After 26 treatments (twenty minutes per treatment). Reduced scalp itching and inflammation. Enhanced curl retention for curly hair. 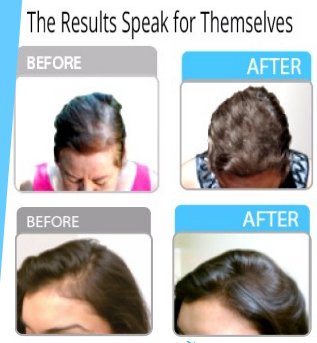 After 52 treatments (twenty minutes per treatment). Hairs on the top of the head and the vertex will start filling in. You can purchase your own Thereadome for home use at Becca's!